Each year in March, the Spanish city of València celebrates Fallas Week, a festival where commissioned constructions are admired and eventually burnt in honor of St Joseph, the patron saint of carpenters. The event is a mix of tradition, art, and satire, and often displays contemporary artworks like this epic Nintendo-themed Trump commentary shown this year. 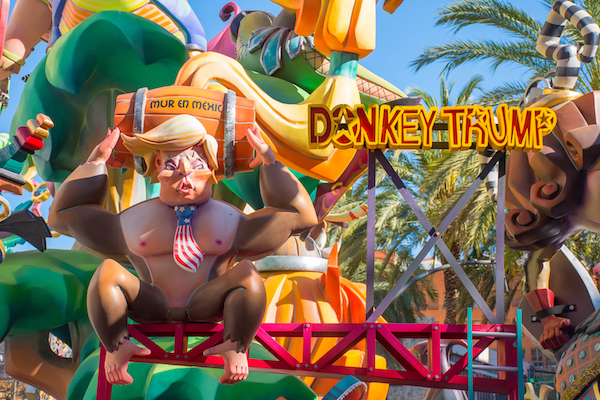 Spotted by local journalist Paco Polit, the installation sports US president Donald Trump with a Donkey Kong-like makeover. The ape aims barrels labeled with words like “Trade Wars” and “Racism” at a little sombrero-wearing man who looks like ‘Mario’. The artwork is branded with the name, ‘Donkey Trump’, styled in a logo alike that of Nintendo’s Donkey Kong. The Las Fallas Festival is said to stem from a custom practiced by artisans in the Middle Ages, who would discard planks of wood used in the winter to prop up lights—known as parots—by burning them in bonfires. The act also marked the beginning of spring, when the materials would no longer be needed. With the intervention of the Church, the event would later coincide with the festival of Saint Joseph. According to València’s tourism website, some of these temporary effigies are so elaborate, they might cost “millions of euros” each to create… only to go up in flames.